I’m stealing away from my girls and Joshua for a few minutes while they’re lounging on the couch stuffed with blueberry muffins watching a movie and avoiding our laundry list of outdoor chores. Amelia is doing this. 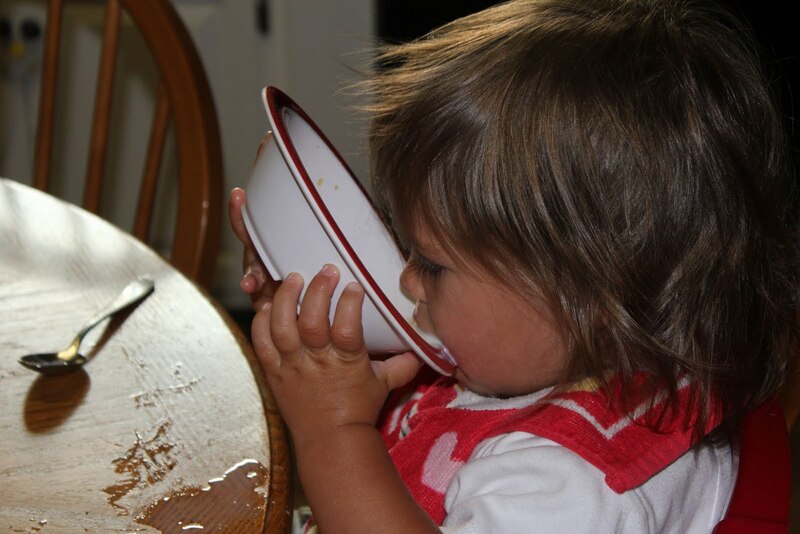 She wanted cereal with milk like her sisters. And actually, she did a really good job eating it! Today we have chores like neatening up the yard that I attempted to cut the other night. This is why I had no Thankful Thursday post. 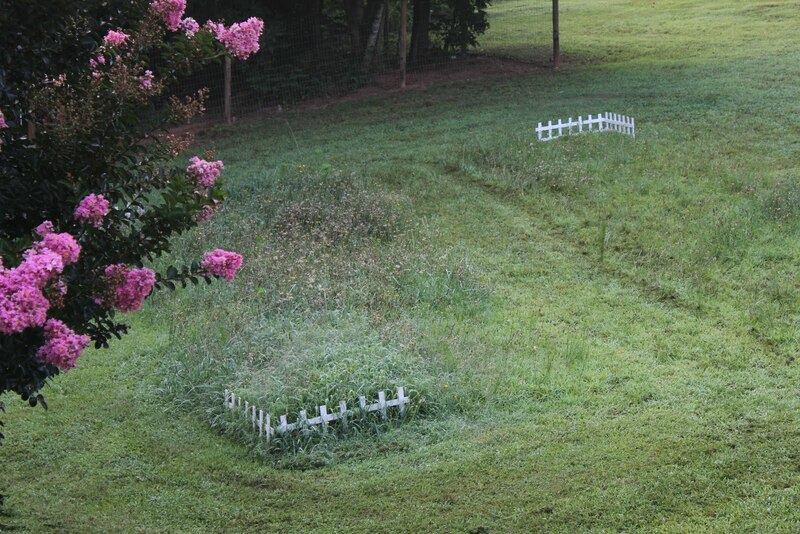 I thought I’d do Joshua a favor and mow at least part of our little lot, but I think I made it worse. The girls were mad because I mowed them a path through their “wild garden.” Oh, well, at least I got thirty minutes alone where all I heard was a constant roaring which might be an occasional improvement over shrieking. We’ve kept pretty low-key busy this week. I finally sorted and framed a bunch of pictures, just in time for Katie’s announcement that she won’t be photographing families anymore. So, I feel like I should definitely treat the ones (like in my header) from our October photo session with care. I took the girls to see the new Winnie the Pooh movie. I love that a review I read last week said Pooh was the only one man enough to challenge Harry Potter on opening weekend. And even though I spent some time with Mr. Potter first, this new charmer from Disney was well worth it. Of course, I spent the majority of my time corralling Amelia who squealed, “Beep, beep!” every time she ran into my legs blocking the aisle, and finally I had to take her out because every time Eeyore came on screen (which was a lot considering it’s a film about the 100 Acre Woods crew finding Eeyore’s tail) she called out, “MOOOO!” I tried to explain that Eeyore is a donkey, but such subtleties are lost on a one year old. By the way, I don’t endorse taking children Amelia’s age to the movies because they are disruptive for others, but I didn’t have much choice and I’d already promised her sisters and they cleaned the bathrooms as part of their eagerness to go, so what’s a mom to do? Speaking of Potter, I think there’s a crazed fan on the loose in the Sham. I’ve spotted two stop signs this week with graffiti that makes the sign read, “STOP VOLDY.” Personally, I find this hilarious, though I also can’t condone defacing stop signs. But they are just one of the strange sightings my small southern town has to offer. My neighbor up the street has a Statue of Liberty in her yard. Two months ago I thought maybe it was there temporarily waiting on VBS, but now I think it’s their new yard art. I walked past it several times last night while helping Madelynne learn to ride her bike. We made her use her own money to buy a new one after she left hers behind her daddy’s truck one too many times. And because it’s a bigger bike, no training wheels. No training wheels means lots of frustration for my perfectionist daughter who’d rather not do something if she can’t do it right the first time. But she’s finally getting the hang of it. Last night she rode around the entire cul-de-sac by herself. Maybe I’ll be able to let go long enough to take pictures next time. This is what I gave Joshua for our anniversary. Printed out on copy paper instead of a card. I found it here at a fun new blog I’ve been following. I’m on the hunt for some new art for the house. I’m hoping for a Family Rules sign by fall. I’ve seen a few I like, but let me know if you have a good source or a good idea or want to help me start embracing the idea that we’re going to be living in this house for twice as long as we ever intended. And now Joshua has gotten all the girls dressed and outdoors, so I guess I better join the Saturday morning work fun.